An image depicting laryngectomy rehabilitation can be seen below. Diagram of tracheoesophageal puncture and prosthesis placement. Image courtesy of International Healthcare Technologies. Blom-Singer is a registered trademark of Hansa Medical Products. The 3 basic options for voice restoration after total laryngectomy (TL) are (1) artificial larynx speech, (2) esophageal speech, and (3) tracheoesophageal speech. Selection of a method should be based on input from the surgeon, speech pathologist, and patient. The decision is best made keeping in mind the patient's communicative needs, physical and mental status, and personal preference. Principle: Esophageal speech is produced by insufflation of the esophagus and controlled egress of air release that vibrates the pharyngoesophageal (PE) segment for sound production. Anatomic structures for articulation and resonance are usually unaltered. Techniques: The 2 basic approaches to esophageal insufflation are injection and inhalation. Both techniques are based on the pressure differential principle that air flows from areas of higher pressure to areas of lower pressure. Injection involves using the articulators to increase oropharyngeal air pressure, which, in turn, overrides the sphincter pressure of the PE segment, thereby insufflating the esophagus. Inhalation involves decreasing thoracic air pressure below environmental air pressure by rapidly expanding the thorax so air insufflates the esophagus. Proficiency in esophageal speech typically requires several months of speech therapy. Advantages: No apparatus must be purchased or maintained, and no further surgery is required. Disadvantages: Speech acquisition is delayed because of the learning curve, and difficulties with phrasing and loudness are possible. Principle: An external mechanical sound source is substituted for the larynx. Anatomic structures for articulation and resonance are usually unaltered. Advantages: Voice restoration after surgery is immediate, and the maintenance for the electrolarynx is minimal (may last 2-10 y). Disadvantages: The voice quality sounds mechanical. Principle: A surgical fistula is created in the wall separating the trachea and esophagus. This puncture tract can be created primarily, at the time of total laryngectomy (TL), or secondarily, weeks or years following the total laryngectomy (TL). Several days after surgery, a one-way valved prosthesis is placed in the puncture tract, allowing lung air to pass into the esophagus. The lung air induces vibration of the PE segment for sound production. The mechanics of the one-way valve allow lung air to pass into the esophagus without food and liquids passing into the trachea. Technique: During the initial evaluation, a speech pathologist measures the length of the puncture tract and selects a size and style of prosthesis for placement. Once in place, the patient digitally occludes the tracheostoma to direct air through the prosthesis into the esophagus for phonation. Hands-free external airflow valves are also available as accessories. Disadvantages: Additional surgery is required for secondary punctures, the prosthesis must be maintained, and aspiration may occur if liquids leak through a malfunctioning valve. Tracheoesophageal punctures can be created primarily, at the time of total laryngectomy (TL), or secondarily, days to years after surgery. If the plan is for a secondary puncture, a simple insufflation test can be performed preoperatively by the speech pathologist to assess the integrity of the PE segment and potential voice quality. Results indicate whether further surgical intervention is necessary during the puncture procedure. If the puncture is performed primarily, insufflation testing is not an appropriate preoperative assessment because the cricopharyngeus will be reconstructed during the laryngectomy. A catheter is placed through the nose and inserted until the end is just below the PE segment, ie, approximately 25 cm of the catheter length. Air is channeled through the catheter to insufflate the esophagus, simulating tracheoesophageal speech. If insufflation is monitored using manometry, the indication for adequate PE segment integrity is a phonation pressure less than 22 mm Hg. For perceptual assessment, the patient performs speech tasks, such as sustained phonation and/or counting for evaluation of phonatory quality and duration. The patient should be able to sustain phonation of /a/ for at least 10 seconds or produce 10-15 syllables per breath. If the insufflation test is performed correctly and phonation is not achieved or is of poor quality and duration, the 4 possible conditions of the PE segment that should be considered are (1) hypotonicity, (2) hypertonicity, (3) spasticity upon egress of airflow, or (4) stricture. If perception is uncertain, the PE segment can be further evaluated using fluoroscopy with barium swallows and repeated insufflations. If insufflation test results indicate failure, several therapies are available. If hypotonicity is present, consider applying digital pressure to the PE segment or an external pressure band around the patient's neck during phonation. If hypertonicity, spasticity, or both is present, consider pharyngeal constrictor myotomy, pharyngeal plexus neurectomy, or botulinum toxin (BOTOX®) injection with electromyographic or radiographic guidance. If stricture is present, dilatation is indicated. Before any prosthesis is inserted, phonation should be sampled with a patent puncture tract. The perceptual quality and effort of that sample guides decision-making. For example, if the voice quality is effortless, loud, and consistent, then the patient may do well with a higher-resistance device with increased durability. If the voice quality is strained and effortful, a lower-resistance device of greater diameter (20F) may be appropriate. If the patient and his or her spouse or caregiver appear able and willing to participate in prosthesis management, a valve with no restrictions on placement procedures should be considered. Indwelling devices, although touted for their advanced design, must be inserted by a trained professional. This stipulation creates a situation of patient dependency on the health care professional. Autonomy offered by devices that can be changed without restriction is appealing to many patients. Conversely, if the patient is unable or unwilling to change the valve independently, an indwelling style device offers more security from dislodgement. Occasionally, the device that provides the least phonatory effort also has a patient-specific tendency to malfunction rapidly. If the device recurrently leaks in less than a couple of months with no treatable cause (eg, candidal infection), a device with higher resistance and durability should be considered. Prices for valves vary from $28 (Inhealth 16F duckbill) to $199 (Provox 2 indwelling, Atos Medical). See the Prosthetic Supply Vendors section for vendor information. Cost issues should be considered when devices are comparable in style and performance. Certain health insurance policies do not cover prosthetic supplies. Patients without prosthesis coverage should be provided cost options when selecting a device. Size: The prosthesis is 6-28 mm in length and 16F or 20F in diameter. Advantages: It has good durability, can be changed independently, and is inexpensive. Disadvantages: Airflow resistance is increased. Size: It is 6-28 mm in length and 16F or 20F in diameter. Advantages: It has decreased airflow resistance, has shorter esophageal extension, and can be change independently. Disadvantages: It has decreased durability and is sensitive to esophageal pressure changes. It is 6-22 mm in length and 20F or 22F in diameter. Advantages: It has decreased airflow resistance, increased security from dislodgement, and a removable strap. Disadvantages: It is clinician-dependent and has the potential for gastric distention from excess air insufflation. Also, it is expensive ($130-199). Evaluate phonation with a patent puncture tract and stoma occlusion to rule out technique problems. Measure the length of the puncture tract. Select and prepare a prosthesis. Dilate the puncture tract to slightly wider than the prosthesis. Align the prosthesis with the puncture tract for insertion; alignment is more important than pressure. Have the patient drink liquid, and watch for any leak through or around the prosthesis. Assess patient phonation with stoma occlusion. Insertion of a low-pressure prosthesis with a gelatin capsule. Top photo shows leakage of ingested liquids around the device, which indicates an expanding tracheoesophageal tract possibly due to a prosthesis that is too long. Bottom photo shows an indwelling-style prosthesis in place. Tracheostoma valves provide 2 primary functions: hands-free speech and housing for heat and moisture filters. These external valves are adhered to the neck, with a valve housing directly over the stoma. For speech, the air pressure generated during increased exhalatory effort closes the tracheostoma valve and directs air back through the tracheoesophageal prosthesis. An adequate adhesive seal is essential to generate hands-free speech. Without a tight external seal, stomal air escape reduces the amount of airflow available for speech. Heat-and-moisture–exchange filters are also available to place over, or in lieu of, the tracheostoma valve. These filters modify the inhaled environmental air. Benefits of the filters include decreased airway irritation and maintenance of airway humidification, which may reduce tracheal secretions. Deteriorated valve: Replace the prosthesis. Candidal infection: Administer antifungal medication. Duckbill tip pressed against esophageal wall: Switch to a low-pressure device. Thoracic pressure changes: Increase the resistance of the valve. Tracheoesophageal puncture tract expansion: Fit a 20F prosthesis. Pistoning of prosthesis: Fit a shorter prosthesis. Radiation effects: Down-stent or perform a repuncture. Clogged device: Clean the device. Duckbill tip lodged in esophageal wall: Change to a low-pressure prosthesis. Incomplete insertion: Dilate and resize the puncture tract. Closed puncture tract: Perform a repuncture. Inadvertent removal: Fit a more stable prosthesis if this situation is recurrent. Aspiration of device: Remove the device using flexible bronchoscopy. Irritation/pistoning of prosthesis: Fit the prosthesis length more securely. Repeated removal/insertion of prosthesis: Decrease the frequency of prosthesis changing, and perform laser removal of the granulation tissue. When a prosthesis is dislodged, patients are instructed to insert a catheter into the puncture tract as soon as possible to maintain patency and prevent aspiration. If they are unable to place the catheter, they may come to the emergency department for puncture tract stenting. Patients are sometimes unaware that they can phonate without the prosthesis. As long as the puncture tract is patent, phonation is possible. Encouraging tracheoesophageal speech to explain their situation may ease patient anxiety. If the patient cannot speak, have them drink a sip of water, preferably with blue dye. If the water leaks through the puncture tract into the airway, the tract is patent. The role of the emergency department staff is to stent the puncture tract with a catheter (8-20F). If no catheters are readily available, a Duo Tube or nasogastric tube works. The next step is to dilate the puncture tract. Progressively increase the size of the catheter until a 16F or 20F catheter passes through the tract, depending on the size of the prosthesis. At this point, the prosthesis can be reinserted. If the patient did not recover the prosthesis, the device may have been aspirated. Some patients report violent coughing after aspirating a valve; however, many patients are asymptomatic. Therefore, diagnostic imaging should be performed. Most prostheses manufactured by InHealth are radiopaque. The indwelling device has only a ring of radiopacity. A chest radiograph should be the first test, followed by a CT scan if a prothesis that is not radiopaque is missing. The final approach should be bronchoscopy. Typically, a prosthesis lodges in the right mainstem bronchi and can be easily retrieved by an otolaryngologist or pulmonologist. Successful voice restoration for alaryngeal speakers can be attained with any of the 3 speech options. Although, no single method is considered best for every patient, the tracheoesophageal puncture has become the preferred method in the past decade. Perceptual studies have demonstrated listener and speaker advantages of tracheoesophageal speech. Despite the potential facility of voice production with the tracheoesophageal puncture, careful attention must be directed to PE segment integrity and mucosal density, valve selection, and troubleshooting. Voice restoration is a process, not a prosthesis. Elmiyeh B, Dwivedi RC, Jallali N, Chisholm EJ, Kazi R, Clarke PM, et al. Surgical voice restoration after total laryngectomy: an overview. Indian J Cancer. 2010 Jul-Sep. 47(3):239-47. [Medline]. Kaye R, Tang CG, Sinclair CF. The electrolarynx: voice restoration after total laryngectomy. Med Devices (Auckl). 2017. 10:133-40. [Medline]. [Full Text]. Goldstein EA, Heaton JT, Stepp CE, et al. Training effects on speech production using a hands-free electromyographically controlled electrolarynx. J Speech Lang Hear Res. 2007 Apr. 50(2):335-51. [Medline]. Singer S, Wollbrück D, Dietz A, Schock J, Pabst F, Vogel HJ, et al. Speech rehabilitation during the first year after total laryngectomy. Head Neck. 2012 Nov 20. [Medline]. Sethi RKV, Deschler DG. National trends in primary tracheoesophageal puncture after total laryngectomy. Laryngoscope. 2017 Dec 27. [Medline]. Zimmer-Nowicka J, Morawiec-Sztandera A. Causes and indwelling times of multiple voice prosthesis replacements in patients after total laryngectomy - analysis of 184 replacements in 42 patients. Otolaryngol Pol. 2012 Sep. 66(5):322-327. [Medline]. Naunheim MR, Remenschneider AK, Scangas GA, Bunting GW, Deschler DG. The Effect of Initial Tracheoesophageal Voice Prosthesis Size on Postoperative Complications and Voice Outcomes. Ann Otol Rhinol Laryngol. 2016 Jun. 125 (6):478-84. [Medline]. Barauna Neto JC, Dedivitis RA, Aires FT, Pfann RZ, Matos LL, Cernea CR. Comparison between Primary and Secondary Tracheoesophageal Puncture Prosthesis: A Systematic Review. ORL J Otorhinolaryngol Relat Spec. 2017. 79 (4):222-9. [Medline]. [Full Text]. Baugh RF, Lewin JS, Baker SR. Vocal rehabilitation of tracheoesophageal speech failures. Head Neck. 1990 Jan-Feb. 12(1):69-73. [Medline]. Bunting GW. Voice following laryngeal cancer surgery: troubleshooting common problems after tracheoesophageal voice restoration. Otolaryngol Clin North Am. 2004 Jun. 37(3):597-612. [Medline]. Chone CT, Gripp FM, Spina AL, et al. Primary versus secondary tracheoesophageal puncture for speech rehabilitation in total laryngectomy: long-term results with indwelling voice prosthesis. Otolaryngol Head Neck Surg. 2005 Jul. 133(1):89-93. [Medline]. Cocuzza S, Bonfiglio M, Grillo C, Maiolino L, Malaguarnera M, Martines F. Post laryngectomy speech rehabilitation outcome in elderly patients. Eur Arch Otorhinolaryngol. 2013 May. 270(6):1879-84. [Medline]. Delsupehe K, Zink I, Lejaegere M, et al. Prospective randomized comparative study of tracheoesophageal voice prosthesis: Blom-Singer versus Provox. Laryngoscope. 1998 Oct. 108(10):1561-5. [Medline]. Dworkin JP, Meleca RJ, Zormeier MM, et al. Videostroboscopy of the pharyngoesophageal segment in total laryngectomees. Laryngoscope. 1998 Dec. 108(12):1773-81. [Medline]. Fukuhara T, Fujiwara K, Nomura K, Miyake N, Kitano H. New method for in-office secondary voice prosthesis insertion under local anesthesia by reverse puncture from esophageal lumen. Ann Otol Rhinol Laryngol. 2013 Mar. 122(3):163-8. [Medline]. Hinni ML, Crujido LR. Laryngectomy rehabilitation: a perspective from the United States of America. Curr Opin Otolaryngol Head Neck Surg. 2013 Jun. 21(3):218-23. [Medline]. Lewin JS, Baugh RF, Baker SR. An objective method for prediction of tracheoesophageal speech production. J Speech Hear Disord. 1987 Aug. 52(3):212-7. [Medline]. Op de Coul BM, Ackerstaff AH, van As-Brooks CJ, et al. Compliance, quality of life and quantitative voice quality aspects of hands-free speech. Acta Otolaryngol. 2005 Jun. 125(6):629-37. [Medline]. Pou AM. 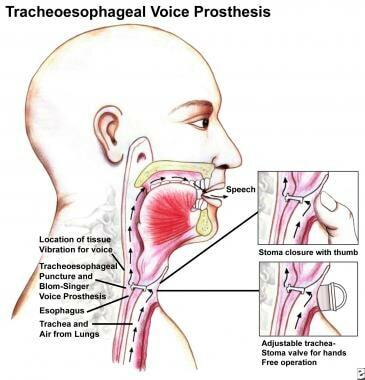 Tracheoesophageal voice restoration with total laryngectomy. Otolaryngol Clin North Am. 2004 Jun. 37(3):531-45. [Medline]. Salmon SJ, Keith RL, Darley FL. Methods of Air Intake for Esophageal Speech and their Associated Problems. Keith RL, Darley FL, eds. Laryngectomy Rehabilitation. San Diego, Calif: College Hill Press; 1979. 55-69. Singer MI, Blom ED. An endoscopic technique for restoration of voice after laryngectomy. Ann Otol Rhinol Laryngol. 1980 Nov-Dec. 89(6 Pt 1):529-33. [Medline]. Terrell JE, Lewin JS, Esclamado R. Botulinum toxin injection for postlaryngectomy tracheoesophageal speech failure. Otolaryngol Head Neck Surg. 1995 Dec. 113(6):788-91. [Medline]. Trudeau MD. A comparison of the speech acceptability of good and excellent esophageal and tracheoesophageal speakers. J Commun Disord. 1987 Feb. 20(1):41-9. [Medline]. Sizing device used to measure the depth of the tracheoesophageal wall and determine the appropriate prosthesis length. Comparison photos of an aspirated indwelling-style prosthesis on a chest x-ray film versus a CT scan image. Only the outside ring of the esophageal flange is radiopaque.